No Refunds will be provided for any other type of cancellation. Each course may have a different rain check policy. OceanSide Golf and any OSG affiliate will use the same policy as the golf course. Proper golf dress code is required at all courses -- No jeans are allowed at any course. Proper golf shirts are required at each course. Unless expressly stated on client's voucher nothing else is included in this purchase Each reservation to a course includes round trip transportation, range balls (unless excluded below), golf cart and round of golf. Unless expressly stated in these Terms and Conditions Nothing else is included. Refunds may be charged a 4% cancellation fee and is at the discretion of OceanSide Golf. There are NO REFUNDS within 24 hours of the scheduled Tee Time. Please add to all terms and conditions: attention, all services, transportation services, our shared services. Shared services means that you will pick up other people along the way. All 3rd parties are charged at the time of reservation based on the agreement with OceanSide Golf. All 3rd parties are responsible for managing their clients and providing information to their clients. OceanSide golf may, at the request of the 3rd party, agree to co-brand all marketing material. 3rd parties with outstanding balances will have full reservation cancelled 24 hours prior to a tee time. Any 3rd party accessing the 3rd Party Portal has agreed to these Terms and Conditions. All 3rd Party reservations are agreed to be paid in Full prior to date of play regardless of if client uses service or not. All 3rd parties agree to maintain a credit card on file that will be used to charge reservations in full at time of reservation. Refunds may be charged a 4% cancellation fee and is at the descretion of OceanSide Golf. There are NO REFUNDS within 24 hours of the scheduled Tee Time. It is the clients responsibility that if you have a question on any of these terms and conditions you will email: teetimes@oceansidegolf.com before your tee time with the question. Unless expressly approved by the golf course only 4 players is allowed to play as a group. It is called a Foursome. Any variation of this must be approved by the local golf course on the day of play. Standard Transportation provided in your price operates as a Shared Transportation Service. This means that you the Client may be paired with other individuals from other hotels. These Shared transportation services may make a maximum of Three (3) stops at Three (3) different hotels. Hotels are in line to the golf course. Hotels that share the same driveway (Entry) are considered the same hotel. Pickup Time / Return Time: Please note each client will recieve a Pickup Time and a Return Time. For Shared Transportation Services these times define when and where you will be picked up and returned. Transportation Compensation: From time to time, and in the event of an error with Shared Transportation, the Client Agrees to a maximum Compensation of not more than Twenty Five United States Dollars ($25 USD) per person. Compensation will be refunded to the credit card used to purchase the Tee Time Reservation and will be processed within 1 week of any written / emailed complaint. caddies will be mandatory in La Cana. The rate will be of US$20.00 + tip per cart; US$30.00 + tip for a foursome (if they all want to share the caddy). End-User License Agreement For OceandSide Golf, LLC Software and Service for Third Parties. IMPORTANT: THIS END USER LICENSE AGREEMENT (“EULA”) IS A LEGAL AGREEMENT BETWEEN YOU (EITHER AN INDIVIDUAL OR A SINGLE ENTITY OR A BUSINESS) AND OCEANSIDE GOLF, LLC (“OSG“). BY ACCEPTING, INSTALLING OR USING ANY PART OF THE OSG DOWNLOADABLE APP OR WEB APPLICATION OR PORTAL (COLLECTIVELY THE “SOFTWARE”), YOU ACKNOWLEDGE THAT YOU HAVE READ THIS EULA, UNDERSTAND IT, AND AGREE TO BE BOUND BY ITS TERMS AND CONDITIONS. IF YOU DO NOT AGREE TO ALL THE TERMS AND CONDITIONS OF THIS EULA, OR CANNOT COMPLY WITH THESE TERMS AND CONDITIONS, DISCONTINUE THE INSTALLATION PROCESS AND USE OF THE WEB APPLICATION AND THE APP, AND YOU WILL HAVE NO AUTHORITY TO USE THE SOFTWARE. Subject to the terms and conditions set forth herein, OSGgrants to you a non-sub licensable, non-exclusive license to use the Software for your own use on any compatible and authorized mobile device or web-capable device, as applicable (individually, or collectively “Device”), owned or lawfully controlled by you, in object code form only, and only in accordance with the applicable end-user documentation, if any (the “License”), subject to the conditions, limitations and terms set forth herein and therein. You, the end-user, assume sole and full responsibility for the selection of the Software to achieve your intended results and subsequent use. a. Limitations on Reverse Engineering, Decompilation, Disassembly, or Modification. You may not reverse engineer, decompile, or disassemble or otherwise attempt to discover the source code or underlying ideas or algorithms of the Software or modify, adapt, translate, recast, alter, or create derivative works from the Software or any portion of it, or provide or disclose any such Software or any portion of it to any third party, except and only to the extent that such activity is expressly permitted by applicable law, or by prior written approval of OSG (which approval may be conditioned, restricted, or denied in the sole discretion of OSG), notwithstanding this limitation. b. Transfer Restrictions. You may not distribute, rent, sell, assign, sublicense, lease, make available on a network, or otherwise, to multiple users (except as may be expressly permitted by your license to use and/or subscription to OSG), or otherwise transfer the Software or use the Software for timesharing or service bureau purposes or otherwise for the benefit of a third party. You may not transfer or assign this EULA or any of your rights hereunder to any other party. e. Copying Restrictions. The Software may be copied onto the hard disk drive of any authorized and compatible computing Device owned or lawfully controlled by you for the sole purpose of installing and using the Software. All such copies shall include the same proprietary and copyright notices and legends as included in the authorized copy of the Software originally provided by OSG or an authorized third party and you shall not remove any such notices or legends from the Software or any copies or modifications of the Software, or otherwise modify the Software. You may not otherwise copy or modify the Software or provide copies of the Software, in whole or in part, to any other party except as may be expressly permitted by your License or Subscription to the Software or other written agreement with OSG. f. Ownership The Software is licensed, not sold, to you for use only under the terms of this EULA. You acknowledge that OSG retains ownership of the Software, any and all portions,copies, or authorized modifications of it, and all rights in and to it, throughout the world, including, but not limited to, intellectual property rights. Upon termination of this License and/or Subscription for any reason, the License and the Subscription and all rights granted to you under this EULA shall terminate and you shall cease to use the Software. Personally identifying data that you may have entered into the Software during your authorized use of it, , remain yours, and OSG claims no ownership or rights in or to it. OSG shall retain all right, title and interest in and to any non-personally identifying data or aggregated data generated by OSG, whether derived solely from, in part from, or without reference to data that you may have entered. You agree that OSGmay collect or derive, and use technical data and related information, including, but not limited to, technical information about your Device, system and application software, and peripherals, that is gathered periodically to facilitate the provision of software updates, product support and other services or technologies to you (if any) related to the Software. OSGmay collect or derive, and use other non-personally identifying data as it deems necessary, in its sole discretion, for the purposes of evaluating customer usage of the Software, improving its products, developing product enhancements, generating statistics, or other reasonable purposes not contrary to the terms of this EULA,. so long as that data is in a form that does not personally identify you or your customer(s), your employees, attendees, or participants. Your use of the Software is permitted only upon your agreement to the terms of this EULA and payment in full, in advance, in good funds, of the License fee and applicable monthly or annual Subscription fees, based upon the License fee and applicable Subscription fee structure set forth at OSG’s website, as they may be revised from time to time, without prior notice, in the sole discretion of OSG, or as may be otherwise agreed upon in writing by you and OSG, as set forth in an OSGLicense fee plan, statement of work, purchase order or other document subject to or referencing this EULA. License fees shall be billed in accordance with OSG’s License fee terms, unless otherwise specified in a written, contractual arrangement entered into between you and OSG, and are due and payable, timely, in full and in good funds, before the date of first Delivery of the Software (the “Effective Date”). Delivery shall be the first date on which OSG or an authorized party on OSG’s behalf delivers to you active login credentials for use of the Software. All applicable Subscription fees shall be billed in accordance with OSG’s fee structure, or other express, written agreement between you and OSG, and are due and payable timely, in full, and in good funds in advance. OSGreserves the right to revise its License and/or Subscription fee structure from time to time in its sole discretion and without prior notice. OSG shall not refund any portion of the License fee or Subscription fees based upon your election not to use the Software. If you change your Subscription level after the 15th of any month, the new applicable monthly Subscription fee payable shall be effective at the next billing cycle. OSG may, from time to time, release updates to or new versions of the Software. OSG shall make available to you, provided that you are not in default under the terms of this EULA, any new version of the Software, but solely to the extent that the functionality of the new version represents the then-current version of the functionality comprising the Software under your existing License. OSG has no obligation to provide to you new functionality or components as part of regular Software updates or version releases. OSGreserves the right to charge an additional fee for your receipt and use of any new functionality or components if you elect to upgrade in order to acquire new functionality or components under a new version of the Software. All versions of the Software, including any new functionality or components, shall be subject to this EULA in its entirety, including, but not limited to the support terms detailed in it. Your rights under this EULA shall remain in effect only for so long as you are in compliance with all terms and conditions set forth in it. If you fail to fulfill, or are in default of, any of your material obligations under this EULA, including, but not limited to, payment of the applicable Subscription fees, OSG may interrupt or discontinue the functionality and/or support of the Software, and may pursue all available legal and/or equitable remedies to enforce this EULA, and any and all of its rights and remedies under it, including, but not limited to, any action at law or in equity, including, but not limited to, an action to enjoin your use of the Software, and OSG may, at any time after your default, terminate this EULA, all Licenses, Subscriptions, and rights granted to you under this EULA. You may request support for your use of the Software through OSG’s web-based support system by visiting http://support.OSG.com. OSG has no obligation to provide support for any version of the Software other than (a) the then- current version of the Software; and (b) the immediate prior version for a period of one (1) year from the date of release of a subsequent version. OSG shall have no obligation to, but may, in its sole discretion, provide support for and charge for such services in accordance with its then-current professional services rates, for problems arising from (a) the use of unsupported versions of the Software; or (b) your integration of the Software with third party systems, software or hardware. YOU EXPRESSLY ACKNOWLEDGE AND AGREE THAT YOUR USE OF THE SOFTWARE IS AT YOUR SELECTION AND YOUR SOLE RISK AND THAT YOU BEAR THE ENTIRE RISK AS TO SATISFACTORY QUALITY, PERFORMANCE, ACCURACY AND EFFORT. TO THE MAXIMUM EXTENT PERMITTED BY APPLICABLE LAW, THE SOFTWARE AND ANY SERVICES PERFORMED OR PROVIDED BY THE SOFTWARE (“SERVICES”) ARE PROVIDED “AS IS” AND “AS AVAILABLE”, WITH ALL FAULTS AND WITHOUT WARRANTY OF ANY KIND, AND OSG HEREBY DISCLAIMS ALL WARRANTIES AND CONDITIONS WITH RESPECT TO THE SOFTWARE AND ANY SERVICES, EITHER EXPRESS, IMPLIED OR STATUTORY, INCLUDING, BUT NOT LIMITED TO, THE IMPLIED WARRANTIES AND/OR CONDITIONS OF MERCHANTABILITY, OF SATISFACTORY QUALITY, OF FITNESS FOR A PARTICULAR PURPOSE, OF ACCURACY, OF QUIET ENJOYMENT, AND NON-INFRINGEMENT OF THIRD PARTY RIGHTS. OSG DOES NOT WARRANT AGAINST INTERFERENCE WITH YOUR ENJOYMENT OF THE SOFTWARE, THAT THE FUNCTIONS CONTAINED IN, OR SERVICES PERFORMED OR PROVIDED BY, THE SOFTWARE WILL MEET YOUR REQUIREMENTS, THAT THE OPERATION OF THE SOFTWARE OR SERVICES WILL BE UNINTERRUPTED OR ERROR-FREE, OR THAT DEFECTS IN THE SOFTWARE OR SERVICES WILL BE CORRECTED. NO ORAL OR WRITTEN INFORMATION OR ADVICE GIVEN BY OSG OR AN AUTHORIZED REPRESENTATIVE SHALL CREATE A WARRANTY. IF THE SOFTWARE OR SERVICES PROVE DEFECTIVE, YOU ASSUME THE ENTIRE COST OF ALL NECESSARY SERVICING, REPAIR OR CORRECTION. SOME JURISDICTIONS DO NOT ALLOW THE EXCLUSION OF IMPLIED WARRANTIES OR LIMITATIONS ON APPLICABLE STATUTORY RIGHTS OF A CONSUMER, SO THE ABOVE EXCLUSIONS AND LIMITATIONS MAY NOT APPLY TO YOU. a. NOTWITHSTANDING ANYTHING CONTAINED IN THIS EULA OR OTHERWISE, OSG WILL NOT BE LIABLE WITH RESPECT TO THE SUBJECT MATTER OF THIS EULA, SUCH SUBJECT MATTER INCLUDING, BUT NOT LIMITED TO, THE DOWNLOADING, DELIVERY, INSTALLATION, USE, OR PERFORMANCE OF THE SOFTWARE, UNDER ANY CONTRACT, TORT, NEGLIGENCE, STRICT LIABILITY OR OTHER LEGAL OR EQUITABLE THEORY FOR ANY SPECIAL, INCIDENTAL, CONSEQUENTIAL, EXEMPLARY OR PUNITIVE DAMAGES OF ANY KIND, EVEN IF OSG HAS BEEN ADVISED OF THE POSSIBILITY OF SUCH DAMAGES. FURTHER, IN NO EVENT WILL OSG BE LIABLE FOR ANY CLAIM BY ANY THIRD PARTY ARISING OUT OF YOUR DOWNLOADING, INSTALLATION, OR USE OF THE SOFTWARE. SOME STATES DO NOT ALLOW THE EXCLUSION OR LIMITATION OF INCIDENTAL OR CONSEQUENTIAL DAMAGES, SO THE ABOVE EXCLUSIONS AND LIMITATIONS MAY NOT APPLY TO YOU. b. IN NO EVENT WILL THE TOTAL LIABILITY OF OSG UNDER OR IN CONNECTION WITH THIS EULA OR ITS SUBJECT MATTER, UNDER ANY LEGAL OR EQUITABLE THEORY, INCLUDING BREACH OF CONTRACT, TORT (INCLUDING NEGLIGENCE), STRICT LIABILITY AND OTHERWISE, EXCEED THE SUBSCRIPTION FEES PAID TO OSG IN CONNECTION WITH THIS EULA AND YOUR SUBSCRIPTION AGREEMENT. THE FOREGOING LIMITATION APPLIES NOTWITHSTANDING THE FAILURE OF ANY AGREED OR OTHER REMEDY OF ITS ESSENTIAL PURPOSE. In the event of any dispute that arises under this EULA, the dispute shall be resolved by binding arbitration Assocation (AAA) in accordance with the then-current Commercial Arbitration Rules of the American Arbitration Association (AAA), with the laws of the State of Illinois, United States of America being applied. The parties hereby consent to conducting arbitration in Chicago, IL USA, and consent to the jurisdiction of the courts of the Commonwealth of Illinois for the enforcement of the provisions of this EULA and the entry of judgment on any award rendered . If for any reason the chosen court of the Illinois lacks jurisdiction to enforce this provision and enter judgment on any award, any court of competent jurisdiction may do so. The three person panel of arbitrators shall consist of attorneys specializing in information technology business litigation with at least fifteen (15) years of experience or persons having been a judge in a court of general jurisdiction. Within thirty (30) days after initiation of arbitration, the parties shall each designate one (1) arbitrator and the third shall be designated separately by the AAA. The parties shall also, within these thirty (30) days after initiation of arbitration, reach agreement on the procedures to be followed to assure that the arbitration will be concluded and the award rendered within no more than six (6) months after initiation of the arbitration. Each party has the right before or during the arbitration to seek and obtain from the appropriate court provisional remedies such as attachment, preliminary injunction, replevin, or such similar type of equitable remedies, to avoid irreparable harm, maintain the status quo, or preserve the subject matter of the arbitration. The arbitration proceedings, together with all discovery made pursuant thereto and statements or documents exchanged by the parties in connection therewith, shall be kept confidential and shall only be used by the parties in connection with the arbitration proceedings. THE ARBITRATORS SHALL NOT AWARD ANY PARTY PUNITIVE, SPECIAL, INCIDENTAL, OR EXEMPLARY DAMAGES, AND EACH PARTY HEREBY IRREVOCABLY WAIVES ANY RIGHT TO SEEK SUCH DAMAGES. FURTHERMORE, THE ARBITRATORS SHALL NOT CONVEY, TRANSFER, ASSIGN, ENCUMBER, OR OTHERWISE REMOVE ANY INTELLECTUAL PROPERTY RIGHTS (INCLUDING, BUT NOT LIMITED TO, PATENTS, TRADEMARKS, COPYRIGHTS, TRADE SECRETS) OF THE PARTIES. All costs of arbitration shall be divided evenly between the parties, exclusive of each party’s legal fees which fees shall be borne by the party that incurs them. No party shall bring a claim in any state or federal court for resolution of a dispute under or enforcement of this EULA unless permitted to do so by law after first exhausting the processes, procedures, and remedies provided in this section. The failure of either party to exercise, in any respect, any right provided for herein will not be deemed a waiver of any other rights hereunder, or any subsequent exercise of any right not previously exercised. To the extent, if any, that any provision of this EULA is found to be unenforceable or invalid, that provision alone will be limited or eliminated to the minimum extent necessary so that this EULA, in its entirety, otherwise remains in full force and effect, and enforceable. The parties agree that: (a ) this EULA is the complete and exclusive statement of the mutual understanding of the parties and supersedes and cancels all previous written and/or oral agreements, communications and other understandings relating to the subject matter of this EULA; and (b ) all modifications of this EULA must be in a writing signed by both parties, except as otherwise expressly provided herein. All rights and remedies under the EULA are enforceable by the lawful successor and/or assign of OSG. No agency, partnership, joint venture, or employment is created by, through, or as a result of this EULA and you do not have any authority of any kind to bind OSG in any respect whatsoever. If OSG is the prevailing party in any action or proceeding to enforce its rights and/or remedies under this EULA, OSG shall be entitled to recover its attorneys’ fees and costs. This policy covers how OCEAN SIDE GOLF treats personal information that OCEAN SIDE GOLF collects and receives, including information related to your past use of OCEAN SIDE GOLF products and services. Personal information is information about you that is personally identifiable like your name, address, email address, or phone number, and that is not otherwise publicly available. This policy does not apply to the practices of companies that OCEAN SIDE GOLF does not own or control or to people that OCEAN SIDE GOLF does not manage or employ. Please read the following policy to understand how your personal information will be treated as you use our web site, OCEANSIDEGOLF.com. This policy may change from time to time, so please check back periodically. You may choose to register with us and create a personal account. If you create an account, you will allow us to tailor your search results to your own personal interests and preferences. The personal information we collect from you, if you choose to register includes: name, address, Email address, password and password reminder. The travel preference information we collect from you includes: departure state, preferred airport, destination/hobby interests, duration of stay preference, price range and seasonal preference. You must create a password to create an account, so your account is password-protected. This is unique and regarded as confidential; consequently, it should be carefully guarded. Ultimately, you are solely responsible for maintaining the secrecy of your passwords, User IDs, and/or any account information. Our secure server encrypts all personal information so that it cannot be read as it is transmitted over the Internet. You may modify your travel profile and account information at any time by going to My Vacation and updating your travel preferences and or account information. OCEAN SIDE GOLF may, from time to time, send you Email messages regarding our product specials and services, only if you have opted-in to receive such messages. Once you have opted-in to receive Email from us, you may choose to opt-out of Email communications at any time by updating your account. Regardless of your communication preferences, even if you have opted-out of Email marketing messages, OCEAN SIDE GOLF.com retains the right to send you a transaction-specific Email confirmation when you have booked a vacation on our website. OCEAN SIDE GOLF has implemented technology and systems that protect the information you provide. In those instances when you are asked to submit private information such as a credit card number, you can be assured that we have security measures in place to protect this information. We protect your information with state-of-the-art Secure Socket Layer (add link to our Certificate with Verisign) SSL Technology. This technology provides the advanced encryption tools necessary to protect information transmitted between your computer and our server. Encryption means that your information is converted into code before it is dispatched over the Internet. Why does OCEAN SIDE GOLF collect information? OCEAN SIDE GOLF’S primary goal in collecting personal information is to provide you, the user, with a customized experience on our site. This includes customized vacation packages to meet your travel plans, budget and other preferences, interactive communications, and other types of services, which are completely free to you. OCEAN SIDE GOLF may advertise certain hotels, destinations, or excursions. By knowing a little about you, OCEAN SIDE GOLF is able to deliver more relevant advertisements, packages, and vacation plans to you. In this process, the advertiser never has access to your individual information only OCEAN SIDE GOLF has access to this information. OCEAN SIDE GOLF does research on our user’s demographics, interests, and behaviors based upon the information provided to us through our web site. We do this to better understand and serve our users. This research is compiled and analyzed on an aggregated basis. OCEAN SIDE GOLF may share this aggregated data with advertisers or business partners. When you are using OCEAN SIDE GOLF site and are asked for personal information, you are sharing that information with OCEAN SIDE GOLF alone, unless it is specifically stated otherwise. If data is being collected and/or maintained by any company other than OCEAN SIDE GOLF you will be notified prior to the time of the data collection or transfer. If you do not want your data to be shared, you may choose not to allow the transfer by not using that particular service. Promotions that run on OCEAN SIDE GOLF’ web site may be co-sponsored by OCEAN SIDE GOLF and another company. Some or all data collected during a promotion may be shared with the sponsor or co-sponsor. If data will be shared, you will be notified prior to the time of data collection or transfer. You can decide not to participate in the promotion if you don’t want your data to be shared. Please be aware that OCEAN SIDE GOLF advertisers or web sites that have links on our site may collect personally identifiable information about you. This privacy statement does not cover the information collections practices of those websites. With whom does OCEAN SIDE GOLF share my information? OCEAN SIDE GOLF will not disclose any of your personally identifiable information except when we have your permission or under special circumstances, such as when we believe in good faith that the law requires it. OCEAN SIDE GOLF may also disclose account information in special cases when we have reason to believe that disclosing this information is necessary to identify, contact, or bring legal action against someone who may be violating OCEAN SIDE GOLF Fair Trade Contract or may be causing injury to or interference with (either intentionally or unintentionally) OCEAN SIDE GOLF’ rights or property, other OCEAN SIDE GOLF’ users, or anyone else that could be harmed by such activities. OCEAN SIDE GOLF may disclose or access account information when we believe in good faith that the law requires it and for administrative and other purposes that we deem necessary to maintain, service, and improve our products and services. OCEAN SIDE GOLF does not sell or rent user information to anyone. We will notify you at the time of data collection or transfer if your data will be shared with a third party and you will always have the option of not permitting the transfer. If you do not wish to allow your data to be shared, you can choose not to participate in certain promotions or contests. Policy and guidelines for use of marks in advertising, promotion and display OCEAN SIDE GOLF and its affiliates have the exclusive rights to use the OCEAN SIDE GOLF service mark and other OCEAN SIDE GOLF marks and logos. Under the trademark laws, the OCEAN SIDE GOLF companies must prevent the use of their names and marks in ways that could give customers and potential customers the mistaken impression that an OCEAN SIDE GOLF company owns or is affiliated with an agency using its marks. OCEAN SIDE GOLF (and trademark law) allow the “fair use” of OCEAN SIDE GOLF marks and logos by agencies, in a truthful, informational way in accordance with the rules provided here. Please adhere to the following specific rules when using OCEAN SIDE GOLF names and marks in promotions on Internet web sites and in print advertisements. All uses of the OCEAN SIDE GOLF name or any OCEAN SIDE GOLF mark must relate solely to OCEAN SIDE GOLF wedding packages and not to the agencies selling them. Agencies that sell OCEAN SIDE GOLF packages may not refer to themselves in any context as “OCEAN SIDE GOLF travel agents” or to their businesses as “official OCEAN SIDE GOLF travel agencies.” Travel agencies may only use signage, window displays, or point of purchase items employing the OCEAN SIDE GOLF name or any OCEAN SIDE GOLF mark (a) as provided by OCEAN SIDE GOLF, or (b) as approved in writing by OCEAN SIDE GOLF. No one may copy any content appearing in any OCEAN SIDE GOLF website, brochure, or advertising without express written permission from OCEAN SIDE GOLF. OCEAN SIDE GOLF marks should be used with the ® symbol, and the use should be accompanied by a legend appearing at the bottom of the page where used that the mark is registered; for example, OCEAN SIDE GOLF is a registered trademark. No one may use the name OCEAN SIDE GOLF or any OCEAN SIDE GOLF mark (or anything confusingly similar) as part of an Internet domain name. No agency may display the OCEAN SIDE GOLF mark by itself on a web site without prior written approval. 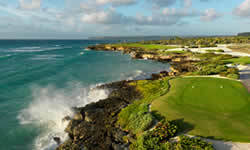 Travel agencies may use an OCEAN SIDE GOLF mark in a website in the following ways: a. An OCEAN SIDE GOLF mark may be used as part of a statement such as “We sell OCEAN SIDE GOLF wedding packages,” so long as all of the words in the sentence are of a similar size. b. An OCEAN SIDE GOLF mark may be used in conjunction with links, schedules, product descriptions, or order forms, expressly referring to the sale of OCEAN SIDE GOLF travel products by the agency. c. In any case where the OCEAN SIDE GOLF name or mark is used, the name of the travel agency must appear on the same screen, above the OCEAN SIDE GOLF name or mark, and in a size at least 125% of the size of the OCEAN SIDE GOLF name or mark used. No OCEAN SIDE GOLF marks may appear in Yellow Pages advertising. As discussed above, truthful, informational statements are permitted in promotional materials and advertisements, such as, “We sell OCEAN SIDE GOLF travel packages.” In any case where the OCEAN SIDE GOLF name or mark is used, the name of the travel agency must appear in close proximity, above the OCEAN SIDE GOLF name or mark, and in a size at least 125% of the size of the OCEAN SIDE GOLF name or mark used. Marks must not be used as an agency identifier; i.e., an OCEAN SIDE GOLF mark may not appear by itself or at the top of a page in an advertisement. OCEAN SIDE GOLF, 100 E. Walton, Chicago, IL 60611, Attn: Web Department. Who is OSG? Relationship between Punta Espada / Corales / La Cana / Teeth of the Dog / Dye Fore golf course management which includes round trip transportation and real time tee times (Please note each course has additional feels). What is the OSG Platform? It is a 3rd Party Portal managed by OSG and the back-end developed by Oceanside Golf LLC. Who do you contact with questions / changes / comments? The respective golf course. Please see Contact Us section of Oceaside Golf website. Payment? Is made in full at the time of reservations via credit card.